Logitech Options is a handy utility for Windows which controls and enables the features of wireless Logitech mice and keyboards. As Logitech offers more than just standard two-button mice, you'd expect some customization of the functionality of these devices. That's where Logitech Options comes in where you can assign different actions to the buttons on your mouse. 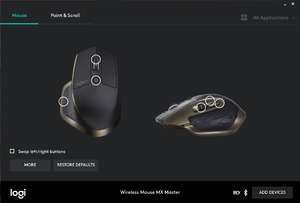 Logitech Options can modify the scroll wheel speed, enable smooth scrolling, adjust thumb wheel sensitivity and so on. Version 7.10.3 is a freeware program which does not have restrictions and it's free so it doesn't cost anything. For security reasons, you should also check out the Logitech Options download at LO4D.com which includes virus and malware tests. Additional screenshots of this application download may be available, too.